Each ascent means that a person rises above one’s stony heart, above the stone he had placed under his head, and performs a special operation known as “sleep,” which means raising MAN. Subsequently, in a dream—in connecting to one’s higher degree—one discovers the ladder, “Jacob’s ladder,” which is the ladder of degrees. The ladder consists of 125 degrees that a person climbs up to the house of God. While one still cannot see the entire ladder, one sees that it reaches the heaven. This is the discovery of the beginning of the way, obtained in the middle line. This is why the Creator appears before him and tells him that He is giving him an Eretz (land), meaning Ratzon (desire), with which he will now begin to work. In other words, the whole of the desire will be sanctified, in order to bestow, to approach the Creator, and Jacob is guaranteed that he will achieve it. This is why Jacob sets up a monument in that place, at the foot of the ladder, and determines that this is the house of God (Beit El). Henceforth, he ascends directly to the purpose of creation. As always, when a person begins to work with the desire, he or she begins to change. On the one hand, more of the evil inclination appears. On the other hand, the person corrects it through the good inclination. An empty desire is called a “pit.” When it is full, it is called a “well.” We see in stories in the Torah that special states of ascent from state to state take place next to wells. This happens with Abraham, Isaac, Eliezer, Moses, and Zipporah. The Zohar puts a special emphasis on the parallels between Jacob and Moses because here there is an extension of the middle line that has been built. In the previous wells that our fathers dug, they were still in the right or left lines. Here, however, they are in the middle line. Obviously, Laban is very interested in Jacob. He agrees, and he is very pleased because it is actually the governance of the Creator appearing from above, both opposite the good inclination, as well as opposite the evil inclination. That governance acts in everyone. Laban, the upper light, the governance opposite the whole of the desire that the Creator created, wishes for the entire desire to be corrected in a person, not merely the small part known as Rachel, the small Nukva (female), but also Leah, the big Nukva. This is why Laban immediately goes for the entire desire, opposite his upper whiteness. This is the desire for which he seeks correction. The result is that a person is compelled to take whatever is available, understanding that even if this is not the beloved Nukva, one must still take it and rise to it, despite the difficulty and the mismatch with one’s own degree. Is Nukva a deficiency, a big desire? Yes, Nukva is a deficiency. It is written  that a man’s wife is as his own body. The body is called a Nukva, the desire (in the soul) with which we work. In the story about the striped, speckled, and spotted, it seems that Jacob knows how to set up the genetic process. The work here is in three lines—striped, speckled, and spotted—which are the three worlds. “Striped” refers to the world of Adam Kadmon, the highest world, where Laban is most dominant. Then comes the “Speckled” (world of Nekudim), where the breaking took place. This is where the black dots over the white background come from. It is specifically through them that the revelation comes to a person. The “Spotted” is the world of Atzilut, opposite Adam’s soul. Through it, we correct ourselves and discover the entire Godliness. Jacob, the middle line, set up his work in such a way that the evil inclination and the good inclination conjoin, meaning the intention to bestow with the egotistical desire to receive. Jacob can work on the stone, on the stony heart; he can connect within him all three worlds—striped, speckled, and spotted. Through this work in the middle line we truly ascend to Beit El, the house of God. Thus, Jacob has four sons from Leah, then more sons from Rachel’s maidens, and finally Rachel gives him Joseph. Therefore, it is inevitable that Jacob and Laban will part. Jacob seemingly escapes from Laban, and Rachel steals the idols because they are her powers, her Kelim, which will have to be corrected. What is the meaning of Rachel’s theft? In spirituality, stealing means receiving what does not belong to me (in relation to my current state), but for which I will pay later. I cannot receive what I do not deserve. There is no bias in spirituality; everything works according to the rule, “They borrowed from Me and I collect.”  In other words, I can receive now and pay later because I cannot do it with my current strength. This is how we grow. Children deserve to receive everything from the family, although they do not bring any income. In the next degree, when the children become parents, they repay. Jacob flees and Laban catches up with him near Mount Gilead, where they eventually make a covenant. Although along the way Jacob follows the middle line, which is seemingly inconvenient for Laban because he wants disclosure in all the Kelim, it is clear that the disclosure must be limited, in small portions. This is why there was a conflict between Jacob and Laban, and why they made the covenant. Man and the upper force form a special system, in which we gradually advance until we achieve congruence with the upper force. What are the angels that appear in the portion when they ascend and descend on the ladder, and when they accompany Jacob? Angels are forces in a person on the way toward the revelation of the Creator in the corrected Kelim, according to the law of equivalence of form. We constantly acquire new forces over the will to receive, according to the ego, until we are corrected into aiming to bestow, from hate to love. The way to reach the Creator is through “love your neighbor as yourself.” This is the great rule; it is our entire correction—love of others. A person who advances on this path and constantly ascends has assisting forces. On the Eve of the Sabbath we say (as written in the Sabbath service text), “Come in peace, angels of peace, angels of the Upper One.” This symbolizes the end of correction. Is it a force from within or are these forces that the Creator operates? These are forces that the Creator operates, which is why they are called “angels.” Angels are as the still, vegetative, and animate in this world, which help us sustain ourselves. An angel might be a horse or a donkey, forces that accompany us and help us carry out tasks, but which are managed by the human degree in us. What is a discovery of an angel? When a person finds an angel, is it a discovery of the force that operates on the person? A person discovers forces by which to continue rising from degree to degree. The Creator seems to always appear in dreams. What is a dream? A dream is a higher degree to which I currently cannot rise. However, I can connect to it by annulling my Kelim: my mind, my brain, and my emotions. It is as though I enter a state of Katnut (smallness/infancy), usually lying down, in order to achieve a higher degree. When I put the stone under my head, I thus cancel all my perceptions and desires, and walk into a dream. That is, I enter a state of Katnut specifically in order to obtain a higher degree, since everything I have acquired in the previous degree is unfit for the higher degree. In spirituality there is a gap between degrees. Each higher degree is the complete opposite of its predecessor. This is why there is the concept of going through the night, through a dream, and struggling with the angels, particularly with Esau’s angel. Each time, a person has to overcome one’s ego and sort out with what one should continue to the next degree, and what one should refrain from using in the meantime. We can see many connections here to the upper degree: a dream is a connection; the stolen idols are a loan for the next degree; Laban is a degree that is still unattainable; is everything a kind of connection here? We climb up the ladder of degrees only by using the ego, the will to receive, the hatred, Mount Sinai. The ladder is built according to the exact same principle as that of the Tower of Babel. 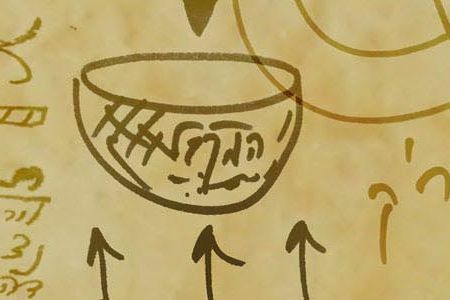 It is the whole of the ego that the Creator created, because “I have created the evil inclination.” When we correct it, we rise above it through the “spice of Torah,” using all the Torah, all the light, Laban, meaning the upper whiteness, which we use in order to correct ourselves until we reach heaven, a state where our entire will to receive is as bestowal, love. Does this portion relate to what is happening in the world today? Are we, too, facing a degree we do not understand? Today, all of us, throughout the world, must understand that first and foremost, we are connected; there is no way out of it. Because we are connected, we must use all our powers. Also, we must understand that it is impossible to keep using only the left line, the egotistical line by which we have been growing thus far, and by which the entire world has been progressing. Rather, now we must also find the right line within us, and build the middle line out of the two. This is why the situation we are in right now is just as though we were standing at the foot of the ladder. The compelling, on the one hand, and the dissemination of the wisdom of Kabbalah, on the other hand, will ultimately bring us to a state where we will finally feel that we have two angels, one on the right, and one on the left. This is when we will ask, “Come in peace, angels of peace.” We will ask that they will come and make peace and put some order between us, as well as turn the egotistical qualities in each of us into qualities of bestowal. Thus, we will be able to connect to one another through those angels. All the corrections are from above. When they arrive, our desire becomes the house of God, Beit El. According to the story in the portion, it seems that things were easier in the past. There were only Jacob and his father. Today it feels as though there are many people and it is very difficult to communicate. The Torah seems to present nothing but a story, which we must actualize in our world. The Torah narrates it as an allegory, and we need to know how to use it. Do we have a place where we can act? Today the whole world is one big Esau. Opposite that, we must “extract” those people who engage in the interior part of the Torah, who are from the right side. It is said about them, “For you are the least of all the nations” (Deuteronomy, 7:7). However, they are the ones with the method. Those from the left should also be extracted, and from the two of them together, the middle line needs to be built, “For they shall all know Me, from the least of them unto the greatest of them” (Jeremiah, 31:33). We and the entire world must rise up to Beit El. We see that there is another falsehood here. How can a Kabbalist know for certain that we are not being fooled again, tricked into the next degree? Or is this how it is should be? Why not? Jacob places his entire reason as a stone under his head and wants to climb up in a dream. He cannot climb up the ladder except in Jacob’s dream. Does this mean that otherwise the ego will not let it happen? When we study, it sometimes feels as though we truly are completely operated, but it is very difficult to feel it in our everyday lives. This is why we have a means called a “group.” In the group we learn how to annul ourselves before others in the group, before love of friends, love of others. In this manner, we learn to dedicate, to leave our minds and hearts, and to connect with the others “as one man with one heart,” literally in one desire, until we cannot tell one’s own from that of others. We simply become one of everyone. Can that state exist in a family or among spouses? It can, provided that the whole world is drawn toward it. We learn how to act this way in a group because toward the group, we can measure it. A person can advance with people with whom one studies and works in mutual spiritual work. When everyone in the group strives for it, each acquires all the powers that exist in the group and can ascend. Any other way is impossible. Babylonian Talmud, Masechet Beitza, 15b.